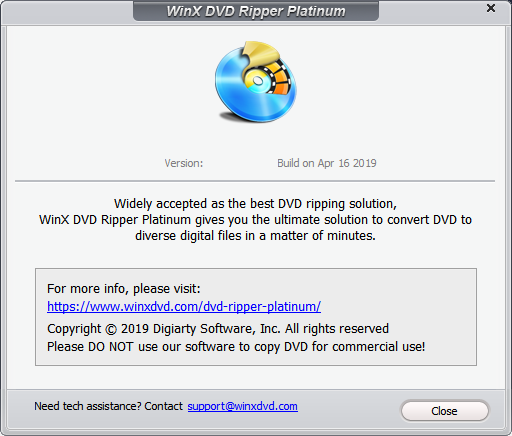 WinX DVD Ripper Platinum is a Windows-based DVD ripper software capable of ripping any DVD (even latest encrypted DVD discs/ISO images) to mainstream videos, such as rip DVD to AVI, DVD to MP4, H.264, MPEG, WMV, MOV, FLV and M2TS. It also helps faultlessly convert DVD to Apple (iPhone/6/6 Plus/5S, iPad/Air 2/mini 3, iPod/5, Apple TV/3, iTunes), Android (Google New Nexus 7, Samsung Galaxy Note 4/Edge/S5 (Mini), HTC One M8, Amazon Kindle Fire HDX), Microsoft (WP8, Surface Pro 3, Xbox One), Chromecast, Sony PSP/PS4, Nokia Lumia 2520, etc. This DVD ripper brings No.1 fast DVD ripping solution thanks to the cutting-edge tech to support Multi-core (up to 8 CPU and Hyper-threading. Besides 350+ built-in profiles, this DVD ripping software has 4 DVD copy modes to meet users' up-to-date DVD backup demands - clone DVD disc to ISO image, to a folder at a 1:1 ratio, backup DVD main title content for playing on PC, PS3, PS4, Xbox, Media Center, etc, and copy DVD title fully to a multi-track MPEG2 file, including all videos/audios/subtitles. The last copy mode costs you 5 minutes only! Continuously update to support the latest DVD copy protections and a growing number of platforms by Microsoft, Apple, Google, etc. With support for Multi-core CPU, this software delivers blazingly fast DVD conversion performance, which is 3x to 5x faster than common DVD ripper in market. Professional Presets - The program comes preloaded with a number of preconfigured profiles for popular devices. Users could also customize and save profiles. High Quality Engine - Give you the highest possible quality for maximum enjoyment of standard DVD content. Deinterlacing - Change interlaced scanning DVD movie to progressive scanning to output much better video effect. Rip DVD to AVI/MPEG/WMV with original DVD AC3/DTS 6 Channels audio track. Output MP4 video with AAC 2/4/6 Channels supported. Build in optimized WMV encoder to fit the requirement of Windows Media Center. Convert DVD to WMV with AC3/DTS audio and stream to PS3 & Xbox 360. Copy all content and data in DVD disc to a UDF ISO image file which can be mounted to the virtual drive and burned to DVD disc later. Copy full title/main content of a DVD to a single MPEG2 file. Keep high quality video, original subtitles, 5.1 AC3 surround and DTS audio. Rip and convert DVD to MP4, H.264 for smoothly playback on Apple video player, e.g. DVD to iPhone, DVD to iPad, DVD to iPod, Apple TV. Rip DVD to Android and Windows devices, HTC One M8, Samsung Galaxy Note 4/Edge/S5 (Mini)/Tab S, Kindle Fire HDX, Surface Pro 3, WP8, Xbox, etc. Rip DVD to PSP/PS3/PS4 on PC. Watch DVD movies on Sony PSP with its widescreen, ultra-crisp LCD screens. Transfer movie to Mobile phone by ripping DVD to MP4/H.264 video. Play DVD on Nokia, Blackberry, Motorola, etc. You can freely adjust all video/audio parameters to set your desired video quality and file size, including video bitrate, video resolution, frame rate, etc. It enables you to select desired built-in subtitle track or add your own SRT subtitle files to the DVD video. Merge and combine different DVD titles into a new entirety; crop video to remove black bars and cut off unwanted area to feature a highlight. The trim feature allows you to set any time point of the DVD as Start Time and End Time to output your desired movie part and duration. The built-in video player enables you to preview DVD movie and take snapshot to save as PNG files. Edit aspect ratio to modify incorrect DVD playback image on iPhone, iPad, iPod, Apple TV, Samsung, HTC, Android, tab, PSP, etc. Improved: DVD analysis kernel to locate the DVD title more accurately. Improved: DVD decoding mechanism to process new DVDs released in 2019. Improved: DVD ripping stability and compatibility with the latest Windows 10 version 1903. Added: Support for new Nvidia GPU accelerator to boost DVD ripping speed. Improved: DVD scanning mechanism to process new released movie discs in Oct, Nov and Dec. Improved: The video quality of H.264-related outputs by using enhanced High Quality Engine. Note: Run the application (not the patch) as administrator.